I actually took this outfit last week to post on my Birthday, but I was too excited to sit at my computer and post it so its going up today! Its been so long since I've done a actual "what Im wearing today" post and I really do apologise! Normally I do actually wear the outfits I photo about on the day I post about them. But various bits and pieces I've been doing recently have meant I've not had time to do a proper one. Fingers crossed I'll actually do one tomorrow! The weather here in the UK doesn't help, by the time I settle down to blog in the afternoon (I generally do blog related stuff from 2pm till about 8pm, taking photos around 3-4) its very dark! I thought it was supposed to be summer and my lighting woes would have gone by now! I wanted this dress for a while and my flatmate saw it on eBay for half the price so I ended up buying it. My justification was that I don't have any red and white striped items. It sounded like a good enough excuse at the time! Im a touch to wide in the shoulder department unfortunately so it's a bit of a squeeze. I find alot of the topshop skater style dresses aren't broad enough for me! I paired the dress with my pleather primark jacket that has served me so well over the years. Ive had it for about 3 years now and it has to be one of my all time favourite items I've owned. I really do want to buy a real leather jacket though at some point, I just haven't found "the one"! Im so picky when it comes to coats and jackets! I also wore my trusty River Island scarf which is the perfect way to jazz up a super boring outfit! Excuse the mega clashy nails too! I did them for my Filofax Blogger Style off entry and didn't change them before I took these! Oops! Had so many entries for my Zara bag giveaway! Rafflecopter has gone down well and seems to easy to use. Hopefully this will mean I'll do more giveaways on here. I'd love to do a weekly one but I don't know if thats overkill! I have an amazing giveaway that Im already planning for my blogs three year anniversary! Gorgeous outfit, loving the mixture of tartan and stripes. That dress is gorgeous. Love it! 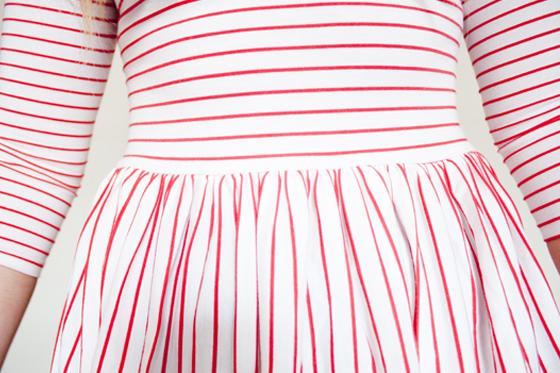 Love the red and white stripes, really cute. This is such a lovely dress! I love it! Love love your dress!!! 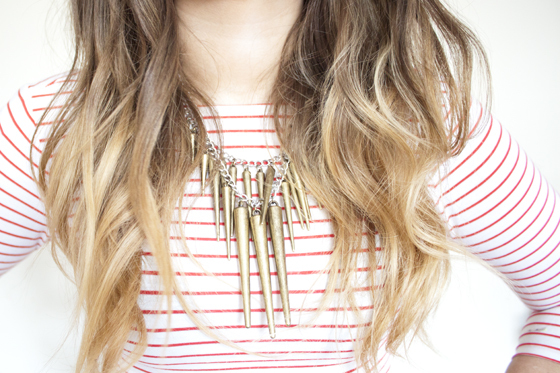 This necklace is totally A M A Z I N G!! i absolutely adore that necklace! 3 years! wow! what made you start blogging? I love this dress, I've not seen it! I wish I could pull stripes off though! The dress is fab, such a nice shape! The dress looks like candy, I love it! I'm so jealous that you find all of these bargain ebay buys. I must own this dress now! my flatmate actually found this one for a change! This dress is really pretty, I love clothes with stripes on them ! Love the River Island scarf as well ! Skater dresses really suit you ! on reflection, i haven't either, I'm not sure why i thought they would work but they did! I'm so glad I'm not alone! i have a really broad chest and shoulders so nothing ever fits right! Such an adorable stripe on stripe look! Lovely dress and great necklace! your necklace is amazing!! those spikes are the perfect color and length for drama. i like it paired with the very girly dress! I'd say weekly giveaways are a bit overkill, but only because I SO LOVE seeing your outfits instead hehe. Your style is an inspiration. I really love the stripes! Aw gutted I missed out on this dress! It's fab! I really want the primary one which is quite similar to this but black and white I thinkkkkk. I love the clashing nails! They add a really nice pop of colour. p.s. Check out my iPhone case giveaway!? i think the nails look good with the outfit! I love this outfit, you look gorgeous and that dress is adorable! The dress is lovely on you, I have it in blue and then literally got another one in red last week from Kmart (in Oz) for $10, delighted! I love your dress!!! VERY NICE!! i never really wear red either! i think the only other red thing i have is the scarf! Lily, it's a gorgeous outfit & that's such a pretty nail polish.. I'm so tempted to get it in the other colour! pretty lovely as always lily! Very cute b-day outfit! 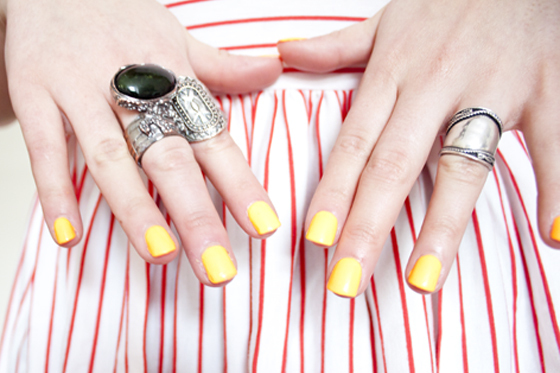 The yellow nails are so bright and lovely, too. I wish we had a Topshop here in Canada. You always post such cute finds there, even if they're bought through eBay. probably! Its quite short on me and IM 5ft5! it would look cute as a tunic with leggings though! You look very pretty! You def. make me want to put more time into my everyday appearance. 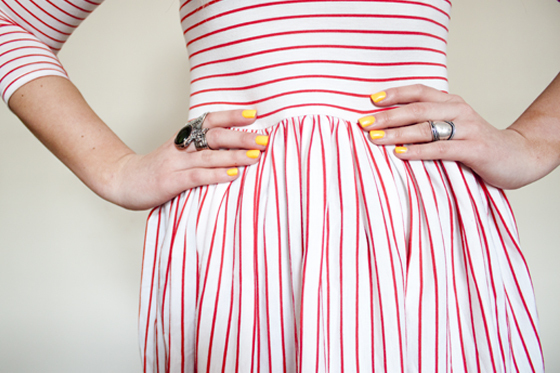 I love this dress on you, it reminds me of a candy cane. It is so hard to find the perfect fitting leather jacket! I like how you combined it with the scarf, such a cute outfit. This dress is so cute, this would be a great dress for the summer!